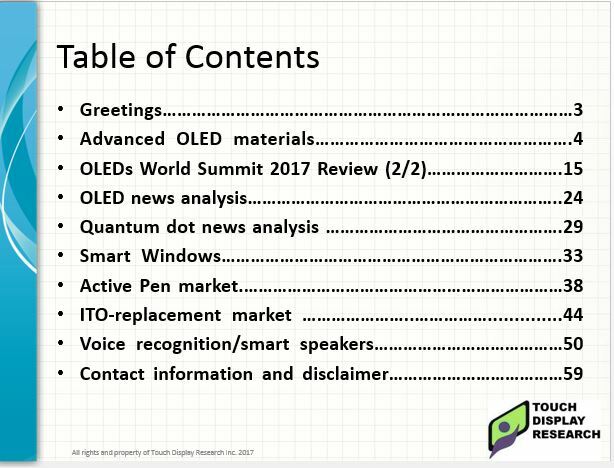 November Report: OLED Material, Active Pen and Voice Recognition - Touch Display Research, Inc.
Santa Clara, California, November 13, 2017—In the recently published “Touch and Emerging Display Monthly Report,” Touch Display Research Inc., a market research and consulting firm, analyzes advanced OLED material, quantum dot, smart windows, active pen, ITO replacement, voice recognition and smart speakers. “Thanksgiving holiday is just around the corner, so, on behalf of Touch Display Research, I wish you a happy holiday season, and thank you for your support. I just returned from Singapore, attending the SEMI FLEX Southeast Asia 2017 conference. It was my honor to meet some of you in person. In early January 2018, I will attend CES 2018 to track and report all the emerging technologies. At the end of January, I will fly to China for the International Quantum Dot Summit 2018 which will be held in China. I hope to meet you face-to-face. 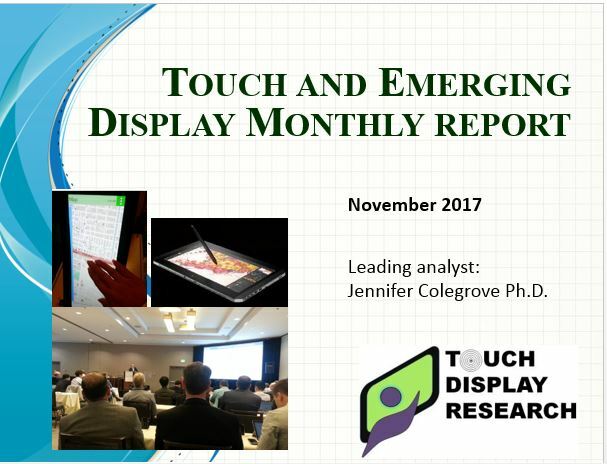 If you cannot make it, it is OK, brief reviews will be contained in the monthly reports,” said Dr. Jennifer Colegrove, CEO and Principal Analyst of Touch Display Research Inc., who has authored reports on the touch panel and emerging display industry for over ten years. The November 2017 report is available immediately. Touch Display Research, Inc. (www.TouchDisplayResearch.com) is a technology market research and consulting firm specializing in touch screen and emerging display technologies such as OLED displays, quantum dots, flexible displays, e-paper displays, ITO-replacement, Active pen, near-eye displays, gesture controls, voice controls, and eye controls. Touch Display Research helps technology companies grow and connecting their technologies to the marketplace. We have been writing about OLED industry for over 10 years. We were the first company to publish Quantum Dot market reports. We were the first company to publish Active Pen market report, and ITO-replacement market report. We have always been there to analyze new and emerging technologies. Touch Display Research provides reports, consulting, and due diligence to touch suppliers, display manufacturers, consumer electronics ODMs/OEMs, material suppliers, investors and venture capitalists. We are member of Flextech Alliance, SEMI and SID.